Description: After my (not so) recent encounter with player hitboxes I decided to make a tool out of it... yeah. Anyway, this allows you to easily modify the player's collision points as well as sprite hitboxes. 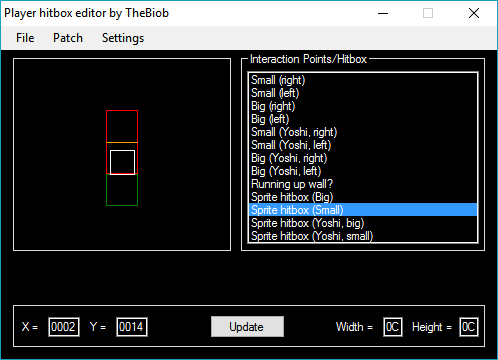 While there are template and interaction files included with the tool the included template patches only modify the interaction points/sprite hitboxes. They do NOT fix any of the side effects of moving the interaction points/sprite hitboxes that may or may not appear. Use at your own risk. Also, how did you made that program? Well, that would be true if my program would modify the rom. It doesn't though. Everything the tool does is generate tables in smw's format and put it in a template file which you can easily modify without the source code. The only hardcoded thing in this tool is the format of the tables and changing that is pointless as you'd have to rewrite the way smw expects the table and there's really no reason I could think of that anyone would want to do that. Just in case if someone else would apply a patch that edits an area this software would modify, causing glitches. Also in case if the user has moved the restore code of the patch into another area. Don't know why anyone would need it but oh well.